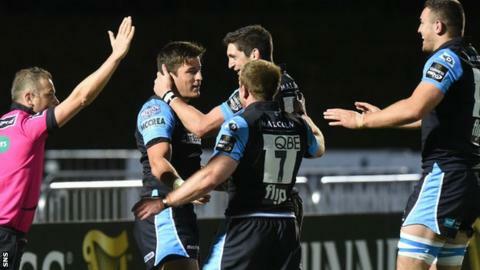 Gregor Townsend again praised the depth of his Glasgow Warriors squad after the 39-21 victory over Connacht. As the head coach again rotated his squad once more, he gave opportunities to players who impressed for the A team against Edinburgh five days earlier. "Eight of our squad played on Monday against Edinburgh and they did well there, so they deserved an opportunity," Townsend said. "It is about making sure we manage the squad throughout the season." Townsend pointed out that his changes were not just purely rotational. "We had three or four injuries from last week," he revealed on BBC Radio Scotland. "We've got players that need to be rested - international players because they, rightly, can't play five games in a row. "We thought the players have brought energy tonight and they got their rewards"
"Our rotation system only works if people play well when selected and that's what they've since done last season. "They blew us away sometimes with their performances and taking opportunities." Inflicting Connacht's first defeat of the season took Warriors to the top of the Pro12 table, although Ospreys could regain the lead should they keep their own 100% record intact away to Munster on Saturday. "Connacht kept coming back at us and the effort we put in was fantastic," said Townsend. "Connacht work really hard for one another like they've always done, but they've got more ambition and more organisation as well. They are tough to break down." Glasgow next travel to Italy to face a Treviso side who have lost their opening three games ahead of Sunday's trip to take on Dragons in Wales. "Treviso are a tough team at home," added Townsend. "They've not played as well away from home this season - they lost heavily to Ospreys and to Scarlets. "But they pushed Munster very close and we'll watch how they get on this weekend. "Any away game, you know you have to play well to win, but we have got confidence throughout the squad and the tempo they played at tonight was fantastic. "We were really excited in the warm up. We thought the players have brought energy tonight and they got their rewards."